Unlike a large proportion of Waterhouse's other work, The Soul of the Rose is not a scene taken from a famous or ancient tale of love. Instead it is a study of a woman in a garden thought to be based on the work of Alfred Lord Tennyson. 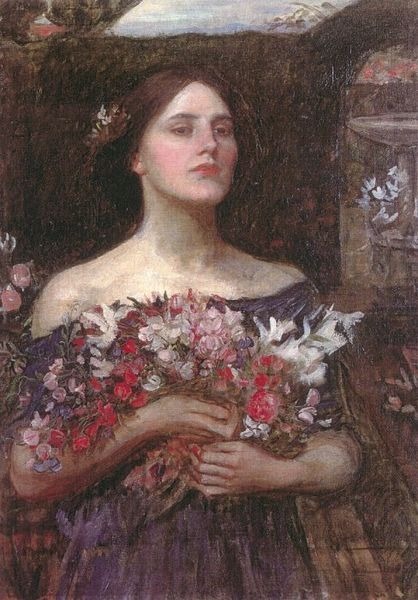 It's important to keep in mind the themes of many of Waterhouse's other works though, as similar themes of lost or unrequited love resonate in this picture. Waterhouse often incorporated a great sense of sensuality in his women, whether in the form of naked flesh or simply a delicate look. Restrained sexuality and longing for an invisible love are key themes in The Soul of the Rose and the artist portrays the woman in the picture without any obvious sexuality, but her position against the wall and her delicate hand indicate subtle sensuality. Many of Waterhouse's paintings are very telling of the place women had in society during his time. Victorian Britain was, for women, a place where for the first time, they started to be politically active and were able to vote and had other political rights that they had previously been denied. Many of Waterhouse's women are trapped or imprisoned and he seems fascinated by the idea of a woman who is powerful yet restrained. This may have been what he observed with women with high public profiles during his lifetime. The Soul of the Rose is no exception to this, as the woman is shown against a brick wall, her pleasure is nature and her thoughts of a love that was. She is weary of dance and play. " "For ever and ever, mine. " And the lily whispers, "I wait. " 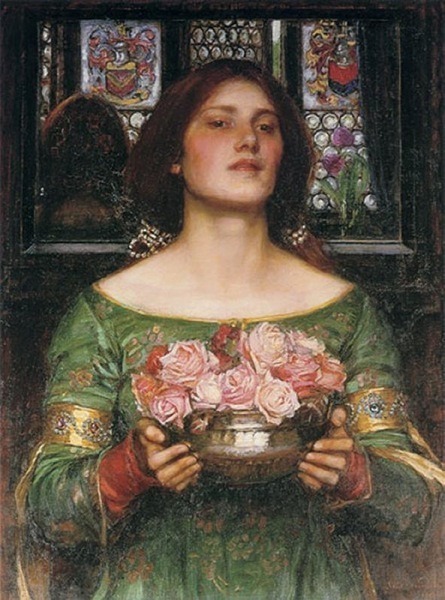 One of John William Waterhouse's best known works, The Soul of the Rose was successful for the artist and remains one of his best known pieces to date. The romantic sensibilities of the painting and the sense of melancholy within the central figures' face allow it to embody the beliefs and stylistic notions of the Romantic period. As with many of Waterhouse's paintings, the main focus in this piece is the central female figure, who dominates most of the painting. In fact, the background has very little importance in this canvas, unlike some of the artist's other works there is no further narrative within the background. Instead the use of high walls and horizontal and vertical lines creates a feeling that this woman is trapped both physically and metaphorically. The artist draws the viewer to the women's face and her sense of longing as she smells the rose. The delicacy of the woman's form and in particular her hand contrast to the dominance of the walls surrounding her, further emphasizing the idea of repressed femininity. In The Soul of the Rose Waterhouse uses a warm palette of colors. Mixes of pinks and earthy oranges and browns help to evoke a sense of summertime. These natural tones, which help to accentuate the blush of the women's cheeks, are contrasted by the cool blue used in her elaborate dress. The blue, interspersed with gold, is rich and denotes wealth and prosperity. 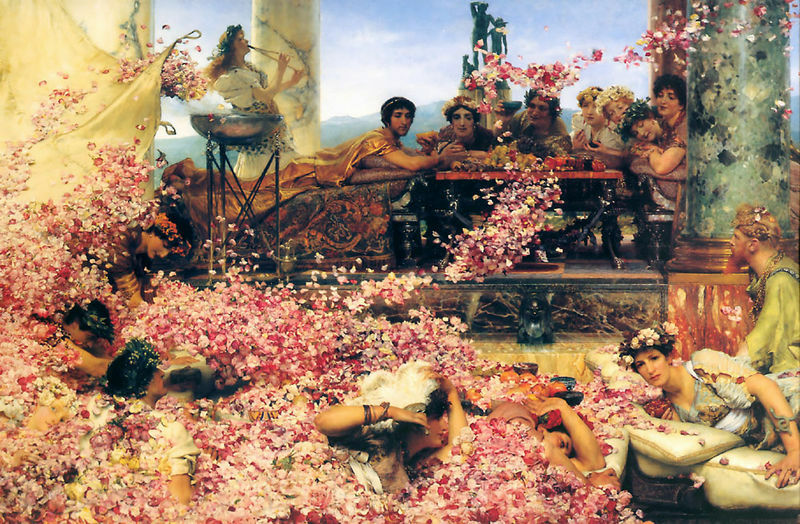 As with most of his paintings, Waterhouse uses a free brush stroke and yet manages to convey detail and inescapable reality into this and all of his other paintings. The often thick brush strokes are restrained by intricate detailing on the face and clothes of the female figure, while the background is left without as much attention, adding depth to the painting. In The Soul of the Rose Waterhouse fulfills the ideals of his age by eliciting a mood of great romance. Although there is only a single female figure present in the canvas it is clear from the look of lost love and longing in her face that the scent of the rose reminds her of a time or a person who is not present in the painting. Her eyes closed and her faced slightly turned away from the viewer indicate that she is lost in her own thoughts. Waterhouse uses natural lighting in this piece and as the woman is outside, this creates further realism and makes the scene more believable. The sunlight coming from above adds a kind of innocence to a sensual picture, highlighting the woman's skin and hair. The Soul of the Rose is today well-known as one of Waterhouse's best works and its romantic appeal is difficult to resist. During the early 20th century Victorian art went out of fashion, and many of Waterhouse's works could be bought for relatively little money. Today, The Soul of the Rose is an extremely popular print and along with the rest of Waterhouse's work is highly sought-after. 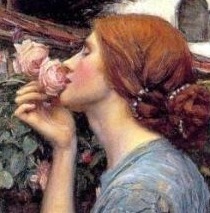 'The Soul of a Rose', also known as 'My Sweet Rose', was painted by Waterhouse in 1908. During the same year the artist produced several similar works featuring women and roses. Other artists have also drawn inspiration from this flower and the romantic connotations it inspires in the viewer. The Soul of the Rose was an exception to Waterhouse's work because it was not a scene taken from a famous or ancient tale of love. 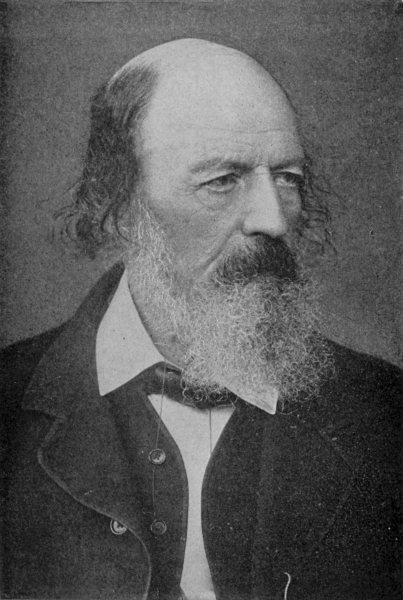 Instead it is thought to be based on the work of Alfred Lord Tennyson. The poem in question is called 'Come into the Garden, Maud' and tells the story of a woman and her thoughts of her lost love. 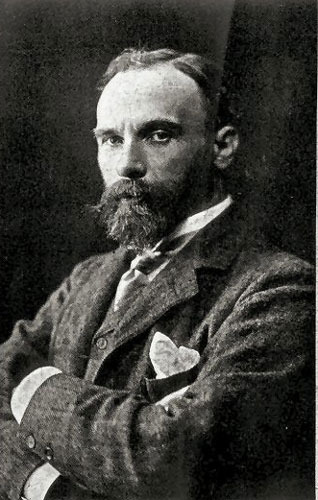 John William Waterhouse was born in the mid 19th century, at a time when the Industrial Revolution was in full swing and poverty was rife within the poorer communities of his native country of England. In the art world, many professionals were rebelling against the pure and realistic lines of the Neoclassical period to have come before them. They started to produce paintings and sculptures which transported the viewer into a new world, far removed from the realities of everyday life.